From its humble, pioneer beginnings to its current incarnation as the largest independent county fair in the United States, the Erie County Fair in Hamburg, New York, is a beloved western New York institution. Annually, over one million people flock to its historic fairgrounds located just south of Buffalo to celebrate agriculture, showcase time-honored traditions, keep the spirit of competition alive, and, most importantly, come together as a community. Through vintage photographs, Erie County Fair presents a visual narrative of the fair's history and stimulates cherished memories rooted in decades of excitement found at this annual summer gathering. The continuity of the American county fair spirit is most evident through these images from the archives of the Erie County Agricultural Society. 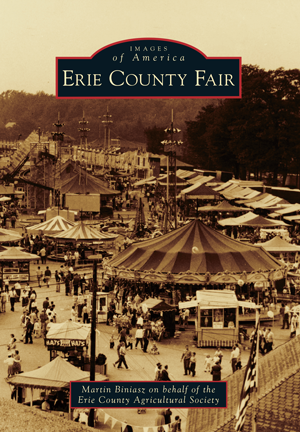 Martin Biniasz is manager of special events for the Erie County Fair and is writing this book on behalf of the Erie County Agricultural Society, a private, not-for-profit membership organization that produces the fair. Established in 1819, the society's mission is to preserve and enhance the agricultural and historical legacy of western New York State.